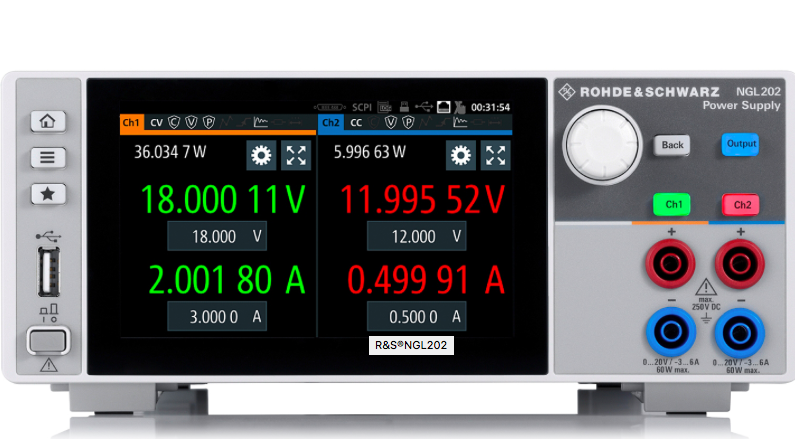 The new R&S NGL200 power supply series from Rohde & Schwarz specifically addresses users in the mobile communications and IoT sectors. The single-channel R&S NGL201 and the two-channel R&S NGL202 deliver up to 60W of output power per channel. The output channels are floating, galvanically isolated and protected against overload and short circuits. The power supplies can sink power in a controlled manner, enabling them to simulate the specific characteristics of a battery. This series also sets new standards with its capacitive touchscreens and large, high-resolution displays. The optimised user interface is especially intuitive, and temperature-controlled fans ensure extremely quiet operation. Extensive safety functions safeguard the DUT and the power supply in the event of a fault. Power supplies used to power IoT devices and other battery-operated devices or to test semiconductors must be able to handle load changes from a few µA to the ampere range without voltage drops or overshoots. Thanks to their fast load recovery time of less than 30 microseconds and minimal overshoot, these power supplies are ideal for such tasks. The linear two-quadrant design of the output stages enables the R&S NGL200 power supplies to operate as a source and sink, with automatic switching from source mode to sink mode.